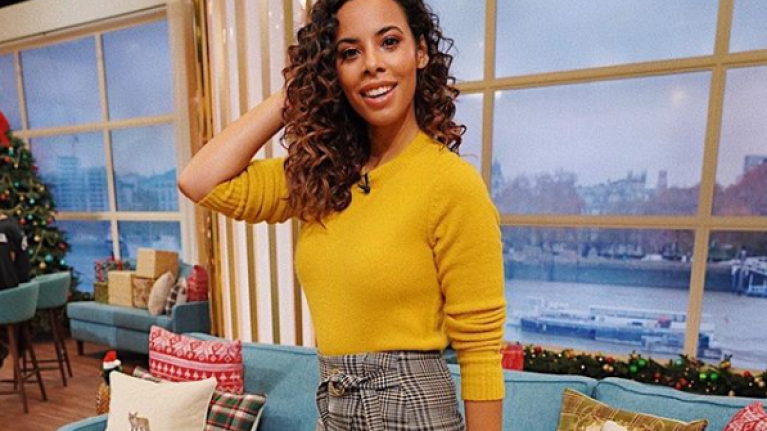 Just like Holly Willoughby, Rochelle Humes has been knocking it out of the park day after day on This Morning. Everyday she has a gorgeous outfit, and whether it's high street or designer, she looks class. Her latest look comes from designer Ranna Gill and we have absolutely fallen in love with it. Lemsip downed ? - let’s do this @thismorning ? The green tartan piece has an embroidered collar as well as a neck tie and a flounced hem, which give it a look that's way more expensive than it actually is. It is pricey though, coming in at $170 (€150), but it's something that you would get so much wear out of and no doubt, people will always comment on how gorge it is. You can find it here. Rochelle has been killing it day after day on This Morning and we particularly fell in love with this All Saints number. Well Christmas has definitely arrived at @thismorning ??? Coming in at €378, it's not going to be a flimsy purchase, however we love what Rochelle did by teaming the dress with a pair of boots and a jumper underneath. Perfect for the cold weather - however, once it gets warm again you can pair it with a pair of heels for the ultimate night out look.